Betty has been a valuable member of our Megasus task force from the get go. 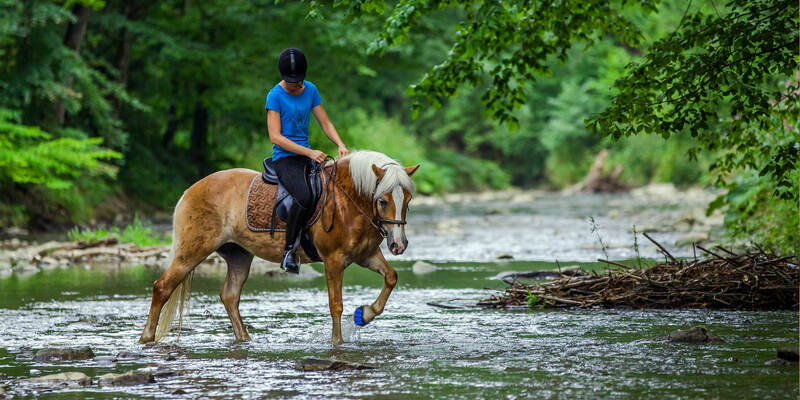 She and her Haflinger Roxy don’t shy away from adventure and always remain calm and collect. That’s exactly what makes this excellent team perfect for Megasus TV and photo shooting. Among other things, Betty and Roxy participated in our video shoot on the Riegersburg for Discovery Channel. Join us as we take a look behind the scenes and learn more about their adventures and test rides. Betty, you and Roxy always keep your cool! We’re glad to count on you as members of our Megasus task force. Can you tell us a bit about yourself and how you learned about Megasus? My name is Betty and for 6 years now my 10-year-old Haflinger mare, Roxy, has been by my side. My life would be completely different without Roxy. Thanks to her, I got involved with positive reinforcement training – clicker training – which I now teach as an animal trainer. It’s always the best teaching Roxy circus acts or tricks and getting to spend time with her. Through Roxy, I began to rethink all I used to know about the housing and care of horses. Roxy and I rode in competitions and at the time, I trusted the common opinion: like every tournament horse I knew thus far, she was shod on all 4 hooves. It was explained to me that without iron, she wouldn’t be able to walk because her hooves grow inconsistently. Bit by bit, I began to question this rational and she was transitioned to barehoof after about 6 months and she transitioned wonderfully. We often ride off road and don’t shy away from adventure. In order to effortlessly master some of the steep, stony passages and long treks, we often need to use some sort of hoof protection. I tried many different hoof protection products, but none of them had me convinced. Finally, I got in contact with Megasus through my barefoot trimmer, Klaudia Schwarz (she is also a member of the Megasus task force). I’m really happy to be able to test this revolutionary invention and to take part in its development. Why did you choose the Mega-GLUE System for Roxy? We chose to go with this system because it had been some time since Roxy wore hoof protection and I wanted to allow her hooves some time to recuperate. That wasn’t the only reason, however: I had a lot planned and we often climb steep and rocky trails. When we take these roads, the most important thing for me is safety. During this time, I don’t want to have to worry about the hoof protection and as a rider, I want to have a secure feeling at all times. Because only when I communicate this feeling with Roxy, can we fully trust one another on the paths and proceed courageously. Other than that, I find the Mega-Glue system to be very practical when you need a permanent solution; you just need to worry about mounting them once. Take the horse from the stable, prepare your horse, mount the saddle, and off you go for a ride. After 3-4 weeks, I naturally care for the hooves. For this, the Megasus are taken off, the hooves trimmed, and the ”sport shoes” are glued on once again. Your brave Roxy has impressed us as a great Megasus TV-Model and also backstage during the mounting. Roxy is always having a great time, but how was mounting the Megasus with the Mega-GLUE system for you? Yes, right now my Roxy is really a TV star. She enjoys making appearances! She likes to be the center of attention when we shoot her and her hooves. For her, mounting appointments are like going to the spa. Now to my experience with mounting: My hoof trimmer mounted the Megasus-GLUE system for me. The system means rock solid hold for me and at the same time, it’s a cost effective and efficient variety. Only 100 ml of the 2-component glue is needed for all four hooves. We were able to mount the Megasus on the hooves and insert the Side-Clips in the slots so that they were almost completely on the hooves. Afterwards, we filled the Mega-GLUE Side-Clips with the 2-component glue, lightly pressed them to the hoof wall and there you have it, mounted Megasus Horserunners! You need a little bit of instinct to work with the glue, but my hoof trimmer managed it masterfully. Naturally, you have to let the glue dry for a short time before heading out for a ride! From what we know about you and Roxy – you guys aren’t scared of anything! What are some of the extreme situations you’ve faced with your Megasus Horserunners? Roxy is an all-around pony and I challenge her a lot. One of the most extreme things that we’ve done with the Mega-GLUE system was our ride with the Megasus task force for the Discovery Channel segment. It was a really exciting experience to take part in with the other test horses and riders. The Riegersburg in Styria has a variety of ground conditions to try out. Roxy and I have already taken rides on extreme trails, but this was a completely new experience because some of the paths are really steep. The Riegersburg has it all – volcanic stones, gravel, pavement and grass. That was an unbelievable experience for me and Roxy! The normal path to the castle is already a challenge for all types of hoof protection, but we also climbed up a few rocks. We were able to do it because the Horserunners provided us with a feeling of security. I know I can trust Roxy’s sports shoes 100%. This assurance is passed on to Roxy and without hesitation, she was able to tackle the steep rocks. I also didn’t second guess the Horserunners and I felt totally safe. Roxy was simply unbelievable! I visibly noticed how hard she had to work and fully use her hooves to climb up the steep rocks. She gave it her all and the Horserunners supported her through it. We haven’t only extensively tested the Megasus Horserunners when filming for the Discovery Channel segment. We also put the Megasus to test every day because we ride predominantly on really rocky ground and climb through the woods. Alongside our adventurous rides, we like to practice spring jumping and love flying over different obstacles. We conquered our fair share of show jumping courses with our Megasus and haven’t left any logs unjumped! 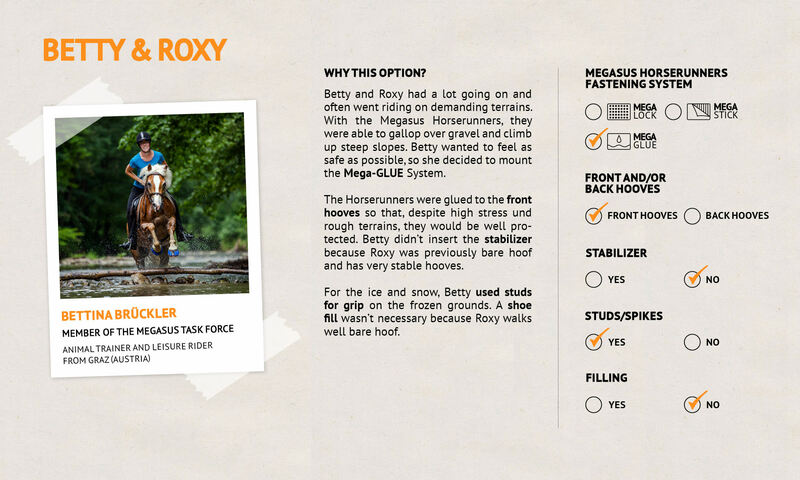 If your brave Roxy could tell you about her Megasus Horserunners, what would she say? She would say without a doubt tell you about her climb up the steep rocks for the TV shooting. With enthusiasm and pride, she would tell you how great the Megasus held and that because she did so well, she’s going to be on Canadian TV. Roxy could tell all sorts of stories because she has experienced so many with her Horserunners. With her sports shoes, she is protected and doesn’t need to constantly keep an eye out for sharp stones. She can, regardless of the ground, gallop full speed and keep up with all my crazy ideas without worrying. You started your journey with Megasus with so much passion. What is the most convincing thing about the Megasus Horserunners? What really convinced me was that the Megasus are firmly fixed to the hooves, tailor-made and no chaffing or rolling is possible, like we often see with other hoof protection products. With the Megasus, you always have a feeling of assurance when riding and I don’t need to take a second and worry about which movements Roxy is making with her legs. We simply feel well protected and at the same time unrestricted. Thank you, Betty! We are already excited for our next adventure and we are proud to have you both on our team.